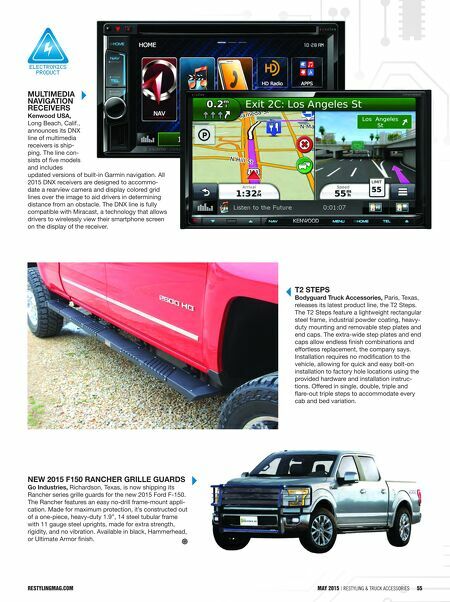 54 Restyling & tRuck AccessoRies | May 2015 restylingmag.com 54 Restyling & tRuck AccessoRies | May 2015 restylingMag.coM GM BLIND SPOT AWARENESS INTERFACE Intraphex, Clearwater, Fla., presents an interface to make the OEM factory 4.2" or 8" displays more intelligent by integrating side view, front and rearview cameras into the OEM display. Side view cameras are activated simultaneously with the turn signal. Four camera views in one lo- cation brings the awareness to the driver of blind spots that exist around the vehicle. Applications for 2014+ Cadillac ATS, CTS, SRX and XTS; 2014+ Chevrolet Colorado, Impala, Silverado, Suburban and Tahoe; 2014+ GMC Canyon, Sierra, Yukon and Yukon XL. ElEctronics Product RAM 2500/2500 ADJUSTABLE LIFT LEVELING KIT ProRYDE Suspension Systems, Minnetonka, Minn., presents its ADJUSTABLE front lift leveling kit for the new Ram HD 2500/3500 4WD radius arm suspension. Pat- ented adjustable technology allows on-vehicle ride height options from 1.5" to 2.5". The kit allows up to 35" tire/ wheel combinations without replacing OEM components and includes shock extenders to retain OEM shocks and ride quality. Adjustable for seasonal and commercial applications such as snowplows and ranch bumpers. Forged and machined steel components are black e- coated for demanding service. 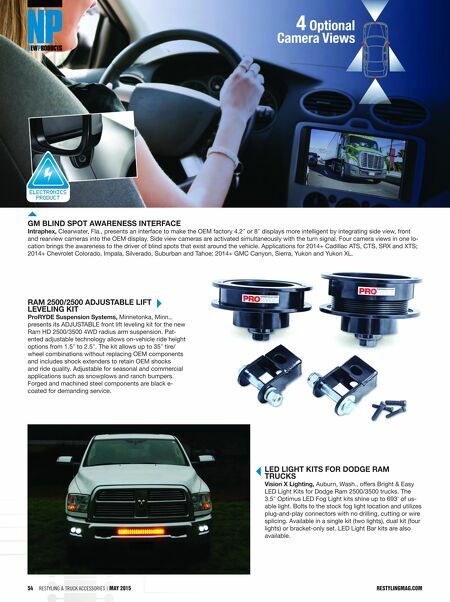 LED LIGHT KITS FOR DODGE RAM TRUCKS Vision X Lighting, Auburn, Wash., offers Bright & Easy LED Light Kits for Dodge Ram 2500/3500 trucks. The 3.5" Optimus LED Fog Light kits shine up to 693' of us- able light. Bolts to the stock fog light location and utilizes plug-and-play connectors with no drilling, cutting or wire splicing. Available in a single kit (two lights), dual kit (four lights) or bracket-only set. LED Light Bar kits are also available.